From Syria to Colombia and beyond, how do societies navigate the pursuit of justice in peace processes? That question animated ICTJ’s annual Intensive Course on Transitional Justice and Peace Processes, which this month gathered 31 participants from nearly 20 countries in Barcelona to discuss the place of justice in negotiations to end conflict. Participants included grassroots activists, seasoned transitional justice professionals, and academics, each of whom brought their personal experience to lively discussions that stretched across the week-long course. These discussions were guided by our instructors, including ICTJ staff members Fernando Travesi, Executive Director; Ruben Carranza, Director of the Reparative Justice Program; and Howard Varney, Senior Program Advisor at ICTJ. ICTJ staff were joined by additional experts who have been deeply involved in peace processes around the world. These practitioners spoke about their experiences from Afghanistan to Syria, unpacking these case studies through detailed discussions. Expert presenters included Hind Kabawat, Director of the Peacebuilding at the Centre for World Religions, Diplomacy, and Conflict Resolution and a member of the Syrian opposition’s High Negotiations Committee; Nicholas "Fink" Haysom, United Nations Secretary-General Special Envoy for Sudan and South Sudan; Asif R. Khan, Chief of the Mediation Support Unit, United Nations Department of Political Affairs; and Juanita Goebertus Estrada, Deputy Director, Institute for Integrated Transitions. These presenters offered case studies drawn from their careers to illuminate the challenges practitioners face in responding to calls for justice while also navigating complex negotiations to end a conflict. For instance, Goebertus spoke at length about the Colombian peace talks, which took place amid decades of ongoing violence. The negotiations sought to end the longest-running conflict in the Western Hemisphere while also fulfilling the rights of its victims. In her presentation, Goebertus emphasized the critical role victims played as active participants who deepened the discussion and ensured that the pursuit of justice was always at the fore. She also praised the engagement of external countries during the peace process, saying that both the FARC and government trusted representatives such as those from Norway to be fair in facilitating channels of discussion. This sort of impartial party can be a key resource, she said. Haysom complemented Goebertus’ presentation with a session on his experience in Afghanistan, Sudan and South Sudan. Haysom’s focused on constitutional reform, pointing out that in many contexts, the constitutions that emerge out of conflict serve as de facto peace agreements. They therefore carry unique importance. Course participants were encouraged to ask these questions and engage in debates around acknowledgement, reparations, truth-seeking and more. They also joined in a media simulation exercise in which they role-played as parties to a peace negotiation, engaging both with each other, mediators, victims and civil society’s representatives and the “press” who covered their discussions. The simulation captured the practical challenges and complexities of addressing justice issues and the pivotal role that media play in shaping the narrative around peace processes. 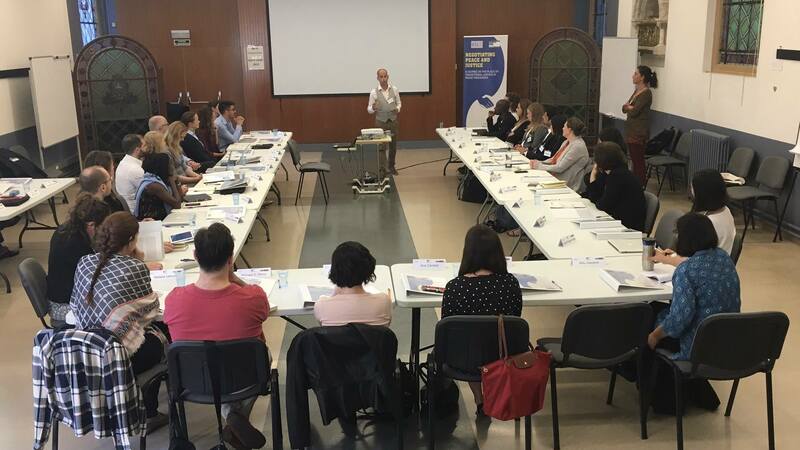 The course was made possible through ICTJ’s collaboration with the Barcelona International Peace Resource Center and the International Catalan Institute for Peace. Stay tuned for details about other upcoming courses through ICTJ.